Restore the beauty of your synthetic wig with a simple roller set. If your favorite synthetic wig has lost its va-va-voom volume, just add a few curls to its synthetic strands. But don’t reach for a curling iron or some hot rollers, as these heated beauty tools may burn and melt the fabricated wig fibers beyond repair. With some expert guidance and a few simple old-school beauty tricks, you'll be ready to create big, beautiful curls in whatever wig you want to wear. Detangle the hair of the wig with a wide-tooth comb. Fill a medium-sized bowl with two to three cups of cold water and one teaspoon of shampoo. Swirl the water with your hands to create a soapy mixture. Place the wig into the water. Gently swirl the wig around with your hands to allow the soap and water to clean the synthetic fibers. To prevent the fibers from matting or creating knots in the wig, do not stretch or pull the wig or rub the hair against itself. Using a circular motion, twirl the wig for one to two minutes. Hold the wig under a stream of cold water, gently rinsing out the soap from the fibers. Drain the water from the basin. Fill the basin with cold water and one teaspoon of conditioner. Repeat the swishing and swirling steps to condition the synthetic hair. Rinse the hair under a stream of cold water. Wrap the hair gently into a large towel to remove the water from the wig. Squeeze the towel lightly to remove the water from the wig. Set the wig on a canvas head form. Gently comb the wig with the wide-tooth comb to detangle the hairs. Spritz a two- to three-inch section of hair with setting lotion. Comb the setting lotion throughout the section of hair with a rat-tail comb. Place a small-, medium- or large-sized plastic roller at the ends of the section's hair. Roll the hair around the roller all the way to the roots. Secure the roller to the scalp with a bobby pin or a duck-bill clip. Repeat until you’ve filled the head with curlers. Place the wig under a hooded dryer. Set the dryer’s heat on a low to medium heat setting. After 60 to 90 minutes – or until the base of the wig is completely dry – remove the hair from under the dryer. If you do not have a hooded dryer, set the wig in a well-ventilated and cool area to dry overnight. 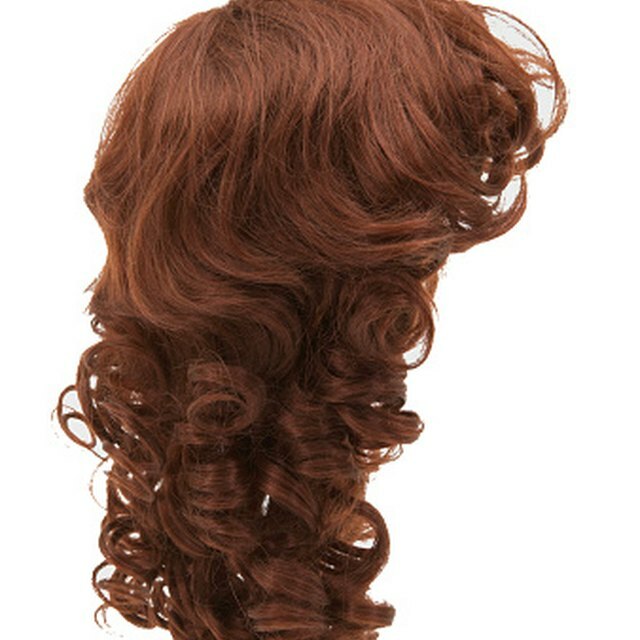 Remove the rollers from the wig by carefully unwinding them. Gently break up the curls with your fingers to style the hair. The smaller the roller size, the tighter the curl. If you don't have a Styrofoam wig head, place the wig on a large hairspray can or large water bottle to detangle and dry. Do not use hot water when washing or wetting your synthetic wig. The heat may damage the fibers and loosen the wefts of hair from the base of the wig. I Want to Reuse Hair Extensions: How Do I Get Old Hair Glue Off?